Six medical students from across the US who participated in the Harvard Catalyst Visiting Research Internship Program, an eight-week mentored program designed to foster diversity and interest in C/T research, present their research at the program’s closing ceremony. The use of machine learning to predict the growth rate of brain tumors. The documentation of brain cell changes in men and women after a season of playing college hockey. The study of the association of eye and kidney complications in Latinos with type 2 diabetes. These projects represent the kind of research that six visiting medical students immersed themselves in during this summer’s Harvard Catalyst Visiting Research Internship Program (VRIP) at Harvard Medical School. The program, designed to foster diversity and interest in clinical and translational research, has been supported by the National Center for Advancing Translational Sciences, a part of the National Institutes of Health, since 2009. This year’s students expected that they’d learn new research skills and knowledge; what they didn’t expect were the bonus experiences. “I didn’t know that I’d also gain a network of mentors and get to know so many fabulous people and new ideas,” said Darrick Potter, a rising second-year student at the Frank H. Netter MD School of Medicine at Quinnipiac University, of the eight-week course. Mentorship, immersion in a research laboratory, collaboration and relationship building are hallmarks of the program, says program manager Carol Martin. “Once accepted, we consider the students part of the Harvard Catalyst community of clinical translational researchers,” Martin said. 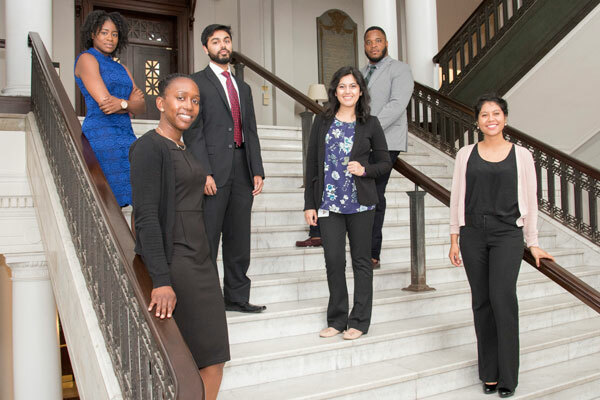 VRIP and the 10-week Summer Clinical and Translational Research Program (SCTRP) for college students are part of pipeline efforts spearheaded by the Harvard Catalyst Program for Faculty Development and Diversity Inclusion. The program also includes weekly seminars on diverse subjects such as bioinformatics and environmental determinants of health, a boot camp class on clinical and translational research and opportunities to shadow faculty and learn practical skills such as how to suture and intubate. Potter and the other students presented their research findings in medicine and public health on July 27. Olajumoke Akinsulire, from the Alpert Medical School of Brown University, is an aspiring surgeon who wants to conduct translational research to improve care for her patients. She presented an encouraging proof-of-concept study of a nutritional supplement given by feeding tube that could better stem the loss of fatty acids in premature infants and possibly prevent chronic lung disease that sometimes develops. Akinsulire plans to continue to work on this project in the Beth Israel Deaconess laboratory of her mentors Camilia Martin and Steven Freedman. “They pulled me up from my starting point and taught me the importance of good mentorship and to love what you’re doing,” Akinsulire said. Martin said that the power in mentorship lies in the guidance that’s offered amid the complicated task of navigating a career in medicine. She found her own mentor in Freedman. “This is the way we learn to do research experiments—like an apprenticeship,” Freedman said, adding that he had great mentors guiding him and is happy to do the same for others. “It is amazing to be part of someone’s life and guide their pathway to success. I take great pride in the people over the years I’ve helped,” Freedman said. Ronilda Lacson, in the Center for Evidence-Based Imaging at Brigham and Women’s Hospital, has been a mentor for VRIP or SCTRP since both programs began. One of her former SCTRP mentees recently graduated from HMS, and she just hired last year’s summer intern, Eseosa Odigie, as a research assistant. This year, she watched VRIP intern Darrick Potter grow in confidence and acumen over the summer as he examined radiology reports to see if features of imaged lung nodules are sufficiently documented to determine which are potentially cancerous. Barbara Jones, who’s enrolled in a clinical and translational program at the University of Massachusetts Medical School, completed a project on adipose-derived stem cells in the Tissue Engineering and Wound Healing laboratory of her mentors Giorgio Giatsidis and Dennis Orgill at Brigham and Women’s Hospital. In addition to providing mentees with technical knowledge and skills, Giatsidis cited the importance of imparting the nontechnical skills needed in a research career. These include how to approach a scientific problem, how to think creatively about solutions and how to find the best ways to communicate. Impressed with the caliber of students he’s hosted, Giatsidis said having Jones in the lab was like “having another fellow in the lab.” When they publish findings, Jones will get credit, as will his SCTRP intern from last summer, Trevon Waters.